Brownies made with cocoa are chewy, chocolate brownies. Smothered with decadent chocolate frosting, they are a chocolate lover’s dream. 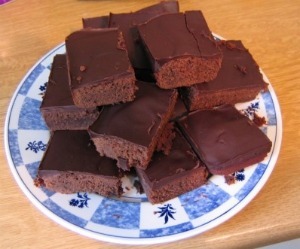 A homemade brownie recipe, cocoa is used to make the brownies and the frosting. For even more rich, chocolate flavor use dark cocoa. With this easy brownie recipe, you can have delicious brownies to enjoy in no time at all. 2. Sift together cocoa, flour, baking powder and salt. Set aside. 3. In a large bowl, cream butter with sugar until fluffy. Beat in eggs and vanilla. Add flour mixture and mix until well blended. Stir in nuts (if using). Spoon batter into baking pan. 4. Bake for 30 to 35 minutes until brownies just begin to pull from sides of pan and a toothpick inserted into the center comes out clean. Remove from oven and cool in pan on a wire rack. 5. Prepare frosting. In a small sauce pan or in the microwave, melt the butter. Stir in cocoa. Add powdered sugar, alternately with the milk. Beat until smooth and good spreading consistency. If frosting is too thick, add a small amount of additional milk. Stir in vanilla. Spread on cooled brownies. Cut into squares and enjoy.